Aside from stealing newspaper ink and collecting lint, ever wonder what Silly Putty was actually supposed to do? Before achieving its status as a classic toy, this non-newtonian fluid was originally developed as a synthetic rubber alternative during World War II. Although it didn’t live up to the Army’s expectations, it eventually made it's way into serious use on the Apollo 8 mission thanks to its gravity-defying adhesiveness. For such a silly substance, it has a surprising scientific pedigree. 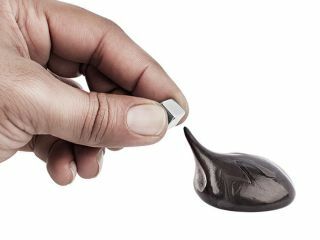 Adding magnetism to this list of unexpected qualities, this Space Putty is the latest development in silicone polymer-based playstuff.